Craft beer and an emerging cocktail culture define Maine’s largest city. Portland, Maine's dining and beverage scene has evolved in recent years, thanks to cocktail bars and such breweries as Rising Tide Brewing Co.
Steaming bowls of ramen, such as the Kimchee Beef with braised short rib ($13), are commonly ordered with a Maine-brewed draft like Bissell Brothers’ The Substance ale ($7 a 16-ounce pour) or Oxbow Farmhouse pale ale ($6 a 12-ounce pour), says bar manager Jack Van Paepeghem. The menu also includes Japanese beers, such as Sapporo, which is $3 a 16-ounce pour during happy hour. Craft brewing has been part of the Portland scene since 1983, when David and Karen Geary opened D.L. Geary Brewing Co., and it’s just one part of Maine’s long tradition of supporting locally made and harvested products. Today, Portland’s 230 restaurants can draw from more than a dozen breweries and three distilleries within the city limits. While Portland has some old-fashioned Maine trappings, including lobster roll shacks and a lighthouse on the bay, its youthful and constantly evolving bar and restaurant scene offers both locals and tourists the opportunity to try new flavors. Portland’s craft breweries have seen rapid growth in the past five years, thanks in part to a tight-knit community of brewers, according to Sanborn. Collaboration is frequent, she adds, and brewers often run into each other in the same neighborhood coffee shops and bars. When a brewery moves to larger facilities, there’s usually a small upstart ready to take over their former space. That routine has been the case at 1 Industrial Way, Portland’s unofficial brewery incubator. This small building, located next to Allagash Brewing Co. and Geary’s headquarters, was the launchpad for Maine Beer Co. and today houses Foundation Brewing Co. and Bissell Brothers. Rising Tide started at the building in 2010 with a one-barrel system, and in 2012, the company moved into a new 15-barrel brewery in the East Bayside neighborhood, a part of Portland that has been transformed into a beverage alcohol production hub. Sanborn notes that East Bayside once was a neighborhood where people didn’t go, but now it’s home to Bunker Brewing Co., Maine Mead Works, Maine Craft Distilling and Urban Farm Fermentory, which produces hard cider and kombucha. Oxbow Brewing Co., headquartered in Newcastle, Maine, has opened a tasting room in the neighborhood as well. “There are more and more reasons for people to come to East Bayside, and we’ve been able to really make this area a destination where visitors can spend the whole afternoon going from tasting room to tasting room,” Sanborn says. If sales at Rising Tide’s tasting room are any indication, East Bayside is living up to its craft beer destination label. In 2014, the brewery sold more than 10,000 tasting flights ($4 for four 4-ounce pours) and 17,000 draft pours ($3 a 10-ounce serving). In addition, Sanborn says the Maine Brew Bus and Maine Beer Tours brought in 2,500 visitors for tours and tastings last year. Rising Tide expanded its hours in May 2014 due to demand and is now open seven days a week. Just a few blocks from East Bayside is the Old Port, a place where locals and tourists rub elbows at neighborhood pubs and trendy fine dining spots. 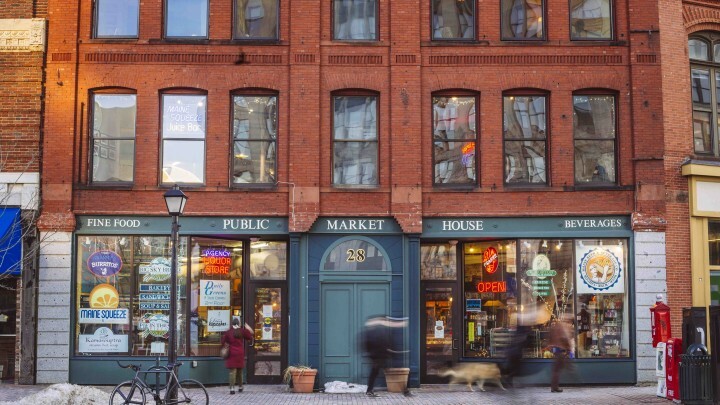 This section of Portland overlooking Casco Bay is a tight grid of brick-lined sidewalks and one-way streets chock full of boutiques, cafés and dozens of eateries offering a gamut of dishes from fried clams to foie gras. Tucked along an Old Port alley is Novare Res Bier Café, a pub and beer garden that carries more than 400 bottles and 33 beers on tap, including a traditional English hand pump. Beers are typically served in several sizes, ranging from 8-ounce to 20-ounce pours ($4.50 to $10). Owner Eric Michaud opened Novare Res eight years ago to provide Portland’s beer fans with a place to find quality brews at a reasonable price. He has a passion for Belgian and German beers, so the import list is impressive, and he’s developed a strong domestic craft beer list as more local producers have emerged. “When I opened Novare, I felt the quality of Maine beer lacked a little bit,” Michaud explains. “Now that the Maine beer scene is so robust, I always have a solid rotation of domestic craft offerings.” He adds that the demand for hoppy IPAs is still strong, but Portland craft beer fans have also developed a taste for sour brews. In 2014, Michaud used his beer expertise to enter the production side of the business, opening Liquid Riot Bottling Co., which has a brewery and distillery. The brewpub, located just a few blocks from Novare Res, offers dishes made with locally sourced meats and fish, 16 beers on tap and a small cocktail list that features the distillery’s products, with drinks like The Dude ($10), mixing In’finiti Well… vodka, house-made coffee liqueur and lavender-vanilla–infused milk. This winter, Liquid Riot served a wide range of beers, from German-style lagers to Russian Imperial stouts, including the Oatmeal stout and Put Yer Dukes Up U.K. session IPA. 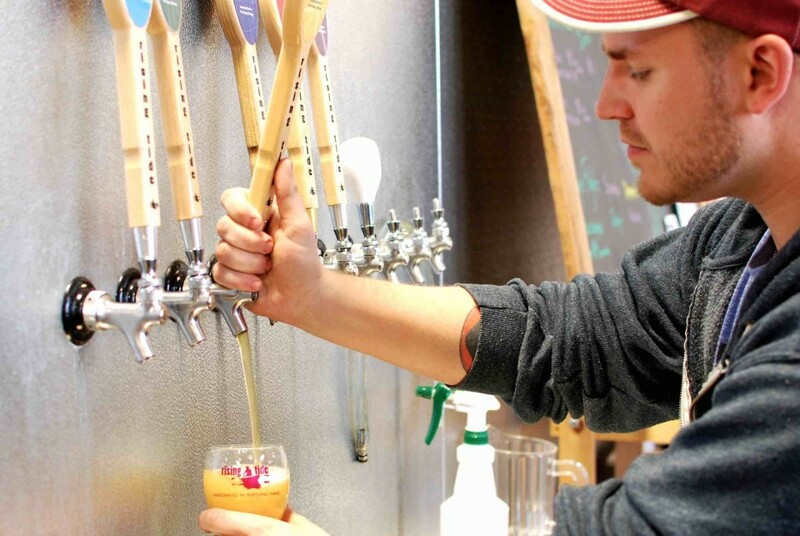 Brews are typically $5.50 a 16-ounce pour, and guests can taste a 4-ounce sample for $2.50. Liquid Riot has keg accounts with a few local restaurants, but most of the beer produced is served on-site. Bar snacks include the Meat Market charcuterie platter ($10), served with local cured meats, house-made terrine, house-pickled vegetables and bread. Theresa Nessel, who places orders and runs tasting events for the retail outlet Maine Beer & Beverage Co., says the store focuses on offering a wide variety of beer. Founded in 1998, Maine Beer & Beverage Co. stocks more than 500 brews, 500 spirits and 700 wines in its 1,500-square-foot space. The store aims to provide something for everyone. “We have everything from Budweiser, Pabst Blue Ribbon and Narragansett all the way up to hard-to-find craft brews,” Nessel notes. Prices range from $2 a 24-ounce can of Pabst Blue Ribbon to $20 a four-pack of 12-ounce bottles of Marshall Wharf Sea Belt Scotch ale from Belfast, Maine. With space constraints, Nessel says Maine Beer & Beverage Co. is constantly curating its selection to make room for newer products. In addition to IPAs, stouts and porters, the store stocks emerging beer styles like farmhouse and sour ales. “We try to focus on stuff you don’t find in the grocery store,” Nessel explains. Portland Hunt & Alpine Club serves approachable craft cocktails highlighting local spirits like the White Noise. Mainers have had a taste for New England–made spirits for years—most notably Allen’s Coffee Flavored brandy. This product from Somerville, Massachusetts, is primarily sold in Maine and, according to distributor and manufacturer M.S. Walker, was a favorite drink of fishermen looking to add a warm splash to their morning coffee. Allen’s is still a strong seller across the state, but Nessel says it isn’t the only regional spirit doing well in Portland. Maine Beer & Beverage Co. has created an end-cap display to highlight products made in Maine, Vermont, New Hampshire and Massachusetts. Whiskey, gin and vodka are top-sellers, but Nessel says people aren’t afraid to try something new, including unusual offerings like Maine Craft Distilling’s Chesuncook Botanical spirit, a gin-like beverage made from carrots. On the West Coast, Volk worked at the James Beard Award–winning bar Clyde Common and has earned plenty of accolades of his own since opening Portland Hunt & Alpine Club in 2013. Having attended college in Maine, Volk understands that locals mistrust pretension. That’s why the Portland Hunt & Alpine Club drinks menu keeps descriptions spare and simple for its list of 22 specialty cocktails, which is broken into categories like “Refreshing” and “Classics.” About half of the drinks are Volk originals, one-quarter of them are riffs on traditional drinks—such as his four different versions of the Old Fashioned—and the remainder comprises recipes adopted from other bartenders he’s worked with across the country. “Our goal is to put a drink in front of each guest that he or she is going to enjoy,” Volk says. 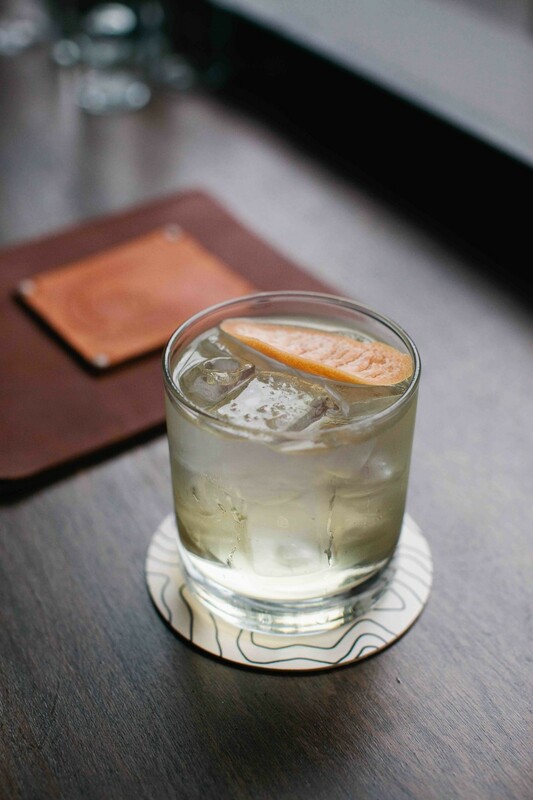 That strategy means catering to a wide range of tastes with cocktails like the White Noise ($8), mixing Massachusetts-made St. Elder elderflower liqueur, Cocchi Americano aperitif and grapefruit zest. Another popular drink is the Smoke and Bitters ($11), featuring El Jimador Blanco Tequila, Cynar amaro, Del Maguey Vida mezcal and Fernet-Branca amaro. Volk has also curated an impressive menu of more than 100 labels for patrons who prefer to choose the base spirits for their cocktails. Quality drives Volk’s spirits list, and he tries to offer selections that Portland customers may not have tasted before. However, because Maine is a control state, achieving this balance can be challenging, Volk says. By forming a good relationship with distributors and working with state regulators, he’s been able to get products that weren’t previously offered in Maine, including Barr Hill gin from Caledonia Spirits in Hardwick, Vermont. Craft beer and cocktails are must-haves even at Portland’s most venerable restaurants, but that doesn’t mean that the wine list is getting short shrift. Fore Street opened in 1996 with a menu stocked with locally sourced products, and while its cuisine has earned two James Beard Awards, its wine list is just as well regarded. “The No.-1 parameter when selecting a wine or cocktail is that it has to complement the food we serve,” says bar manager Greg Arruda, noting that the wines tend to be fruit-forward and Old World in style. The list changes regularly, but a recent by-the-glass menu featured nine whites, 13 reds, one rosé, three sparkling wines, four Sherries, two Madeiras and two Ports. Notable offerings include the 2013 La Vis Dipinti Vigneti Delle Dolomiti Pinot Grigio ($6.75) and the 2010 Burgo Viejo Rioja Crianza ($8). Wines by the bottle range from the Maso Poli Trentino Pinot Grigio ($36) to the Krug Clos du Mesnil Blanc De Blancs Brut ($575). Arruda notes that the bottles available at any given time represent roughly one-third of Fore Street’s total inventory. Arruda says that 80 percent of guests have wine with dinner, which might include appetizers like cracker meal–crusted rainbow smelts ($12) and such entrées as grilled heritage pork chop ($34). He’s noticed that the interest in cocktails is growing. Fore Street recently added specialty drinks, while sister venue Street & Co. offers a full bar with no cocktail menu. “When I started here 11 years ago, our guests didn’t ask for a drinks list,” Arruda says. “About five years ago, people started saying, ‘What do mean you don’t have one?’” Fore Street’s most popular specialty drink, the Colonel Blanton ($16), features vanilla bean–infused Blanton’s Bourbon and orange bitters, served on the rocks. At Miyake, also run by Pai Men Miyake owner Masa Miyake, the wine list is short and affordable, aimed at complementing dishes like miso marinated grilled black cod ($15) or tofu and hijiki with sesame sauce and avocado ($12). 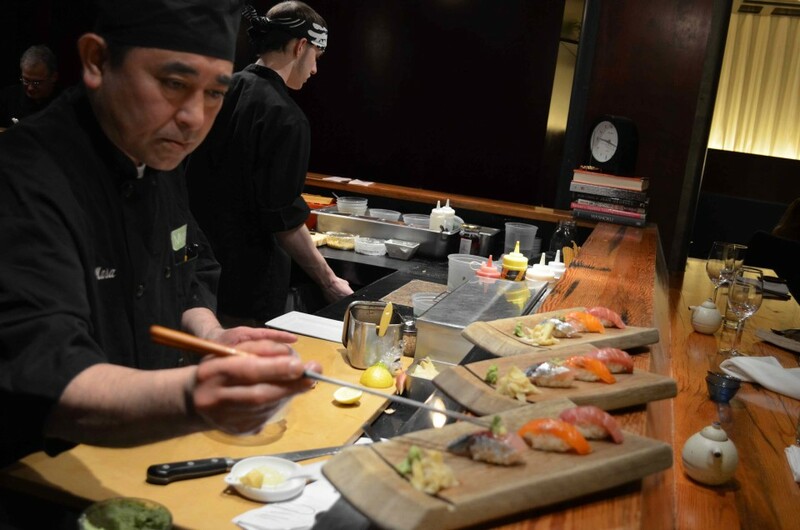 The menu offers 11 different sakes, ranging from $6 a 3-ounce pour of house sake to $91 a 720-ml. bottle of Ippongi Denshin Rin junmai daiginjo. Wine bottles range from $30 for the 2012 Altadonna Grillo to $72 for L. Aubry Fils Premier Cru Brut Champagne. General manager Courtney Packer says the restaurant tries to include a few out-of-the-ordinary varietals, as well as Chardonnay and Pinot Grigio. “Because Miyake is a place for special occasions where people tend to go outside their comfort zones, it puts them in the mood to try something different,” she notes.